Genevieve Gibbs, having rid herself of her cheating, thieving, utterly repulsive spouse, former Henry Adams mayor, Riley Curry, and Cletus, the loathsome hog Riley treasures, has declared her independence and is looking forward to being a new woman even if she is sixty-something. This time she refuses to change herself to please anyone—not even Clay Dobbs who has loved her for decades or Marie Jefferson, her housemate and lifetime best friend. There’s a new man in town, retired big rig driver Terrence Christopher “T.C.” Barbour, a widower who has arrived in Henry Adams from Oakland, California, to help another widower, his nephew Gary Clark, who is struggling to handle all the responsibilities of single parenthood. T. C. is not only a real gentleman and good looking enough to set Gen’s heart a flutter, but he also likes the new Genevieve. Rev. Paula Grant, pastor and psychologist, has done wonders helping various members of the community with their problems, but her own seem to have increased with the death of her grandfather. Paula knows she will have to deal with her psycho aunt when she returns to Oklahoma for her grandfather’s funeral, but she is not prepared for all the secrets that will be revealed, some of them deeply buried. These are the two leading stories in this seventh book in Jenkins’s Blessings series, set in Henry Adams, Kansas, a historic black town founded by freed slaves after the Civil War. However, there are several smaller stories as well. Fans of the series will be happy to see the town’s children are still a vital part of the scene, and other familiar characters play their necessary roles, including favorites such as town owner Bernadine Brown and Mayor Trent July and his wife Lily Fontaine July. Riley and Cletus return to complicate matters. Long-time Jenkins readers may recognize Henry Adams as the setting of her first novel, Night Song (1994). 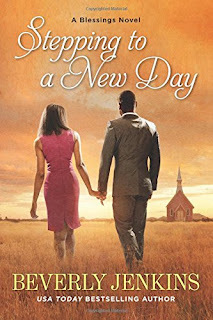 The town has changed a great deal since Bernadine Brown bought it on eBay with a portion of the $275 million divorce settlement she and a tough lawyer exacted from Bernadine’s cheating husband (Bring on the Blessings, Book 1). The improvements to the town continue, and the population keeps growing. But the unique spirit of the town remains. Some label this book a contemporary romance, but I think it is closer to women’s fiction with romantic elements. The romance between Gen and T. C., both in their sixties, is sweet and endearing, but it is only a part of their stories and an even smaller part of the book over all. Regardless of the label applied, Jenkins gives readers a feel-good story that offers a mix of sweetness, humor, sentiment, and redemption. I’ve been reading the series since the first book, and I’m always ready for another visit to Henry Adams. I particularly liked that this novel shows characters over fifty still changing and growing. I definitely recommend this one. Sounds like a good read. Thanks for the excerpt.